Each week on Football FanCast we will be celebrating those special breeds who lit up the Premier League with their unique brand of utter genius. This time out we pay homage to a versatile dribbler who had stadiums rising to their feet. Ten days before Christmas in 1990 a raw, skinny teen made his debut for his home-town club. With his scraggly mop of hair and pipe-cleaner physique he more resembled a wastrel shoegazer than professional footballer or more unkindly a bedsit kid who exists on nothing but own brand cola. He certainly didn’t look like a future Galactico and two-time Champions League winner. Then he got the ball at his feet. His shoulder dipped. He ran. Then he did. Steve McManaman was highly rated by those in the know as he made his way through Liverpool’s academy but that could be said of so many. Only the rare, exalted few however break through that early promise, make their mark and eventually become a club legend, tearing things up in a style that is indomitably and uncompromisingly theirs and theirs alone. And with McManaman it is a style that is deceptively hard to define. Was he a winger? After all, so many of his better moments began out wide and entailed a dribbling high-speed dart of zig and zag that had defenders back-peddling in panic before committing and finding themselves put on their backsides. That is the trademark of every pacy wideman worth their salt. That though would discount the Merseysider’s organisational skill-set, both with and without the ball. In possession he schemed and probed and threaded, his mind hurried but every touch accompanied with care and thought. 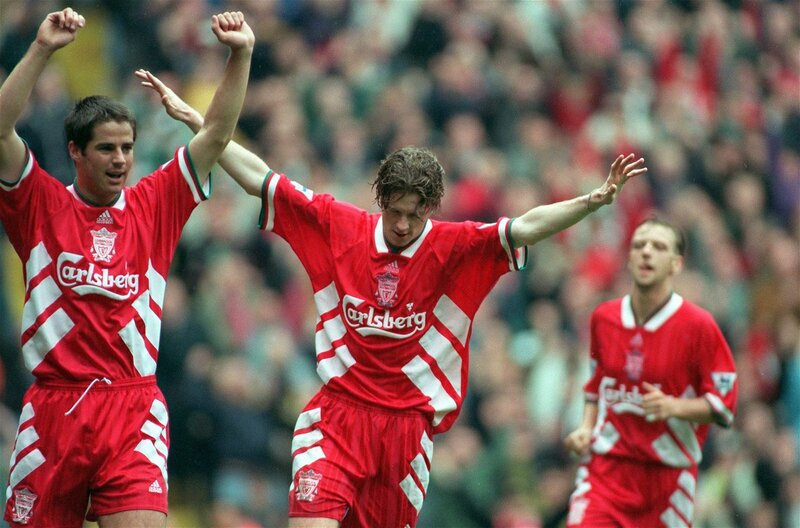 Macca made things happen and delighted in making things happen, to such an unselfish extent that years later Robbie Fowler insisted that his ex-team mate actually hated scoring goals. Unless they were volleys of course, another trademark of his. So he was a creative midfielder then? Someone perhaps in the Hazard mould? Well yes, but also no. Because how many players of that ilk would be slotted into one of the most glamorous and expensively-assembled teams of all time, alongside Redondo in the Real Madrid engine room? How many Hazard-types would Terry Venables – at the time as astute a coach as you’ll find in world football – employ as an international wing-back? Versatility is a damned attribute in football. It suggests being a jack of all trades but master of none. With McManaman no matter where he was stationed he was influential and integral. His nine years at Anfield pretty much straddled the entirety of the nineties, an era that saw off the Souness decline and ushered in the Spice Boys. A League Cup and FA Cup is a meagre return for his longevity and consistently stellar performances amidst two different, fantastic sides but of course there are moments that stand out, pristine and immortal. There were the brace of 4-3 wins over Newcastle. His mazy individual effort against Celtic. The stunning late winner that toppled Arsenal. A cornucopia of exquisite touches and solo marauding that had stadiums to their feet. Then he was off, to Madrid, paving the way for Michael Owen and Gareth Bale to follow, and in his first season in Spain a man of the match display against Manchester United in the Champions League reminded us of what the Premier League had lost: a combination of industry and ingenuity from a player who looked like he could tune a guitar by sight. 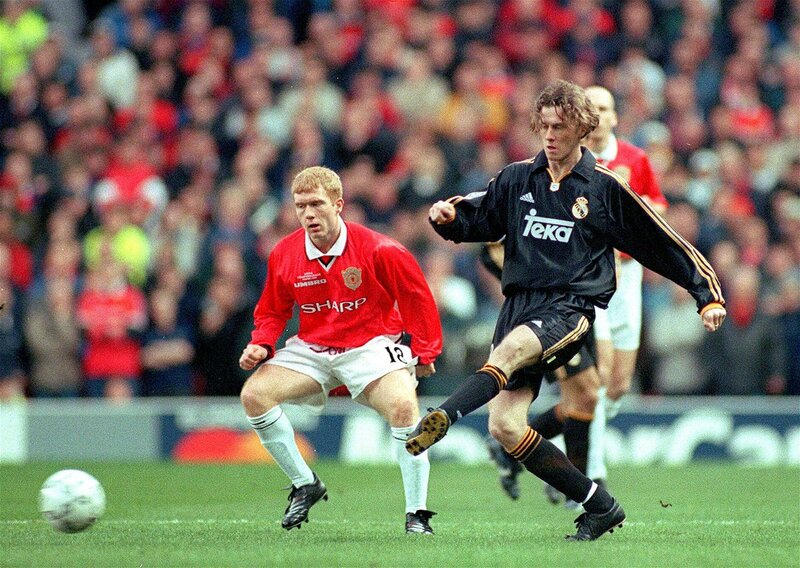 McManaman was simply brilliant that night. In May of 2000 Real faced Valencia in an all-Spanish final and Fernando Morientes had put Los Blancos ahead. With the game edging into its final quarter a long throw was headed clear to just outside the box. The ball came down almost vertically. The 37-cap England international bicycle-kicked a volley sweet and hard into the bottom corner of the net and a European capital erupted. “I just shut my eyes and it went in,” he later claimed, presumably with false modesty because a player as erudite as he would know it was a cracker. During his four years abroad he won the supporter’s player of the year award twice while his team-mates loved him for his work-rate on the pitch and affable nature off it. His coach Vicente Del Bosque often referred to him as a ‘caballero’, a gentleman. To the Spanish press meanwhile he was ‘The Versatile Englishman’. They meant it endearingly. To them he was a master of all trades.